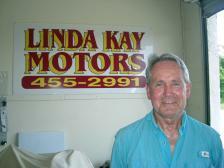 My wife Linda and I moved to Central Florida in 1998, and with our new home, came the opening of Linda Kay Motors. We relocated from the middle of Kansas, primarily an agri-business area. I was there for 34 years as owner of the Ford-Mercury agency. I also owned the Hertz Car Rental franchises in four communities along I-70, Kansas City to Denver until 2003 when I sold them. When we relocated to Florida, I had no intention of getting back into auto sales. However, after living in the area a short time, I could see that there was a void in the market. There was a need for good, clean previously owned autos. We decided on the name Linda Kay Motors (she always wanted to see her name in lights) I told her that this is as close as it's going to get! Sooooo ... Here we are!!! I still enjoy working with cars and I get a good feeling when a buyer is happy with their purchase. About five years ago we started focusing on custom buying (you tell me what you want-we'll find it) We go to the two major auctions in central florida every week, with over 10,000 cars and truck to view and choose from. We charge $500.00 over acquisition (dealer cost). We have a long list of satisfied customers, as well as their relatives. It's a fun way to have a WIN-WIN situation. We have a great staff consisting of Ken Rodgers, sales associate / internet mgr, Juan Montoya, bilingual sales associate, and Linda and Gerry Harris owners. Ken is our new Internet Manager. He and his wife Trudy moved to Cocoa Beach from Amsterdam, NY, in 1992. 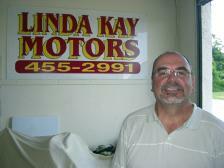 Juan Montoya is our bilingual sales associate living in Indianatlantic fl. He compliments our staff very well. Give him a call at 321-549-1159. 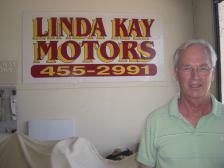 You will find him very helpful and personable.